Sultan Barakat speaking at the Qatar Foundation Annual Research Conference (ARC) 2016, 22 March 2016, Qatar National Convention Center. Right: with Dr. Patricia McCarney in the panel discussion chaired by Dr. Anna Grichting. © Qatar University. The region, at all levels, now expects to be treated with dignity and to be the driving force behind its own development. It is high time to pull together to establish a ‘Regional Reconstruction Strategy’ that maintains a holistic, problem-solving outlook while drawing on various forms of intervention eg. community driven development, inter-regional development projects, targeted counterinsurgency operations, stabilization, state building and so on. Novel approaches rooted in genuine regional leadership, broad participation, youth engagement, and the utilization of technology will increasingly need to be applied. The pillars of such a strategy – seven in total – should be a collective regional vision, effective local participation, smart security, reconciliation and justice, equity, reconstruction and development, and capacity. Collective Vision: With the aspirations of the Arab Spring unrealized and many countries descending into sectarianism, what is needed now is a collective vision that goes beyond national borders. This would include pooling the region’s resources, specifically all the ingredients for large-scale development, such as human resources, an educated population, capital, mobility and nature. 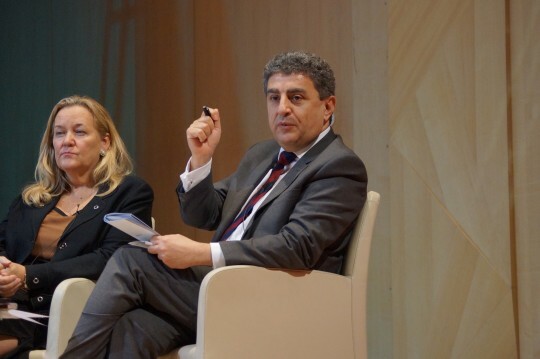 Sultan Barakat, panel discussion, with Prof. Patricia MacCarney, Director, Global Cities Institute, University of Toronto, at the Qatar Foundation Annual Research Conference (ARC) 2016, 22 March 2016, Qatar National Convention Center, © Qatar University. Broad Participation: It is important that the regional vision recognizes that development requires an active civil society, a free media, and rooting action and ideas at the local level and with popular participation. The process of engaging in a region-wide consultation where contributions are coming from schools, villages, city halls, political parties, unions, and many other civic forums can help the region start dreaming about what it wants to look like in the 50 years to come. Smart Security: Instead of a collective vision for development we have one for defence, formed with the excuse of the Islamic State group. All appreciate that a minimum level of security is important for implementing reconstruction, but a lack of security cannot be a pretext to do nothing. Reconciliation and Justice: No long-term investment in reconstruction can be protected without genuine reconciliation across the region. Twenty years ago the main fault line was Israel-Palestine. Today, there are many additional fault lines that need to be addressed. Equity: A common mistake with reconstruction is that it proceeds without sufficient regulation and monitoring to ensure that benefits are equitably distributed. This region has repeatedly seen how easily reconstruction ‘lords’ – most of whom were previously warlords – can emerge to line their pockets at the expense of the general public, thus perpetuating that country’s crisis. Reconstruction and Development: There is an urgent need to find new ways of inducing development through international engagement with the region. The current instability has shifted spending toward security and away from the basics of development. As a result, some of the most important development indicators – freedom of expression, women’s participation, poverty, quality of education – have taken a step back. Building Capacity: To do this we must invest enormous amounts in fostering sustainable capacity at regional, national and local levels. It is essential to invest in education at all levels, in particular going beyond primary education to support the young men and women that will become leaders with the conviction and capabilities to rebuild the region. For all this to happen, fragility must be addressed within a coherent regional vision, not individualnational plans. It would be constructive if the international community and donors would try to view the region as a whole as one canvas in which to facilitate cross-border mobility of population, capital, ideas, and labor and encourage regional responsibility with different countries leading in their areas of competency. International partners can support this with new and innovative forms of funding that utilize collateral guarantees from the region, not just individual countries. If we can embrace a truly regional approach, there may be a day when we elevate human dignity and human development above petty politics and sectarianism. Dr. Sultan Barakat is the director of research at the Brookings Doha Center and a senior fellow in the Center for Middle East Policy at Brookings. He is known for having pioneered both scholarship and practice in the field of post-war recovery. In 1993 he founded the Post-war Reconstruction and Development Unit, a world-leading center at the University of York. Barakat’s current research focuses on state fragility and recovery in the Middle East, as well as the role of Qatar in conflict mediation. Barakat has been widely published, and has over 25 years of professional experience working on issues of conflict management, humanitarian response, and post-conflict recovery and transition. Much of his work has been based in, but not limited to, the Middle East and North Africa, sub-Saharan Africa and South Asia. His research focus includes strategic conflict assessment; post-war reconstruction and state-building; humanitarian action; education in emergencies; and program evaluation and value attribution. Underlying these themes is a principal research concern with public diplomacy towards the Muslim world and the effectiveness of the research-policy nexus. Barakat has acted as principal investigator on numerous large-scale conflict and recovery research projects for the World Bank, the EU, U.K. Department for International Development (DFID), the Office of the U.N. High Commissioner for Refugees, The Institute of International Education, United States Institute of Peace, the International Labour Organisation and others. Over the past three years, he has led an international multidisciplinary team in carrying out an education focused conflict analysis of Somalia on behalf of UNICEF; evaluated the effectiveness of the Afghanistan National Solidarity Program in terms of the reintegration of refugees on behalf of the World Bank; and completed a flagship Economic Social Research Council funded project investigating the impact of DFID-sponsored research on British state-building policy.